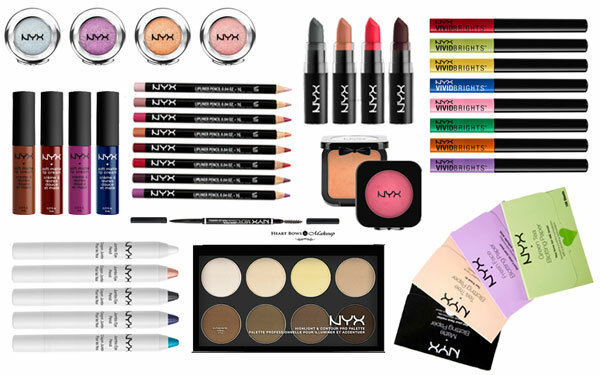 NYX is a US based cosmetic brand which is known for delivering great makeup products at affordable prices. Recently, NYX was launched in India, in collaboration with Nykaa, an online store. Now, the brand has also opened a store in Mumbai and hopefully we’ll see some more branches all over India. With all these new mesmerizing brands launching around us, it can be very overwhelming to decide which one to pick. Most of the NYX products perform well but we handpick the top 10 best NYX makeup products which are total must haves! These are the most talked about and best matte lip products ever. 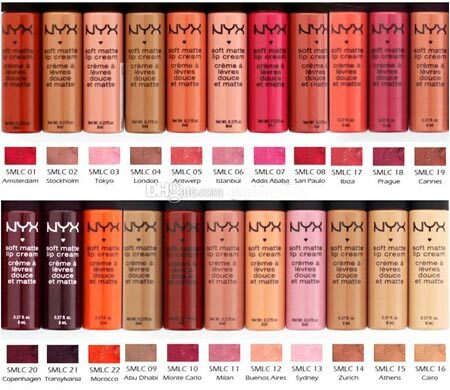 Available in 34 different shades, the NYX soft matte lip creams cater to every skin tone. From bright pinks to browns, nudes, reds and even blues and purples, the range has all the colors. The applicator is a good old doe-foot making the application of the lip cream very easy. They have a creamy formula which dries down to a matte finish. The lip creams are extremely comfortable with a wear time of 4 hours. If there is one thing that you cannot miss buying from NYX Cosmetics, it has to be their Soft Matte Lip Creams. The price may seem like alot for a drugstore eyebrow pencil but it is well worth it when the pencil is an exact dupe for Anastasia Beverly Hills’ Brow Pencil which retails for Rs.1500 ($21). This is easily the best drugstore eyebrow pencil ever. It has a great shade range and comes in very slender double ended black packaging. One, for the brow product and the other for the spoolie to brush the hair in place. The product is stiff and hard, but just enough creamy to achieve easy hair-like strokes. The brow pencil has a great staying power and doesn’t smudge or budge. 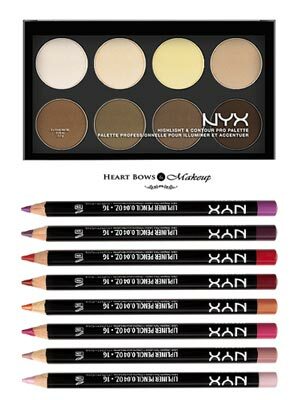 It is a total must have from NYX Cosmetics for great eyebrows. 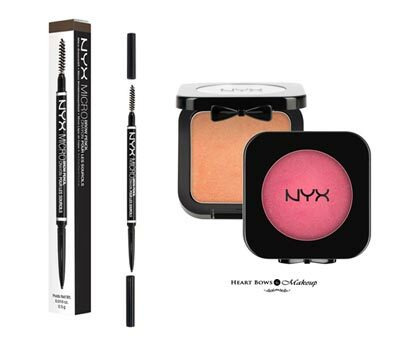 The NYX blushes come in a black square casing with a transparent top and a bow closure accent. The packaging is very cute and adorable! Available in 24 shades, from mattes to shimmers, these are a must have in every vanity. 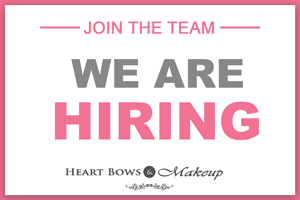 The blushes are highly pigmented and a little goes a long way. The texture is powdery but not chalky. They stay on the cheeks for a good 7-8 hours.The NYX HD Powder Blushes are extremely beautiful for a drugstore brand and are one of the best NYX products for both fair & dark skin tones as they have such a great variety of shades! 4) NYX Matte Lipsticks Price: US $6 Rs. 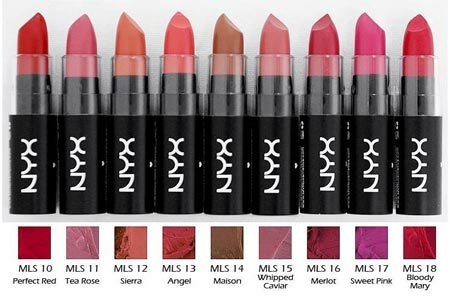 625 – Best NYX Lip Products! The NYX highlight and contour palette comes with 10 shades: 5 to highlight and 5 for contouring. It is a favorite drugstore highlight and contour palette for many people and can easily beat many high-end ones. The powders are not at all chalky and blend in beautifully. They stay put for a good 6-7 hours. It caters to both dark and fair skintone making it a total NYX must have. It might feel a bit expensive but will surely last you a very long time! Said to be a close dupe of MAC lip liners, these pencils are one of the best lip pencils ever. They come in a slim, black wooden packaging that needs to be sharpened. In a shade range of 60, there is something for everyone. The pencils are highly pigmented and stay put for 8 hours. The texture is smooth and comfortable to wear. The NYX Slim Lip Pencils are such a great quality product that there is nothing bad to say about them. Definitely one of the most affordable and best NYX Cosmetics Products. If you have a higher budget, you can try the NYX Glide On Pencils too! The NYX Jumbo Eye pencils are a cult favorite. They come packaged in an all white sharpenable packaging with transparent lids. The jumbo pencils are available in 32 shades and have great pigmentation. These multipurpose eye pencils and can be use as an eyeliner, kajal, eyeshadow base or even as an eyeshadow. They have a staying power of 5-6 hours which is pretty good. 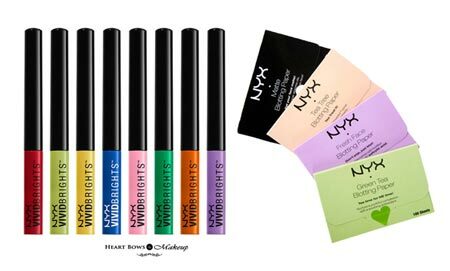 The NYX eye pencils are definitely one of the best NYX makeup products and deserve a spot in the Top 10. These eyesahdows by NYX are a total game changer. They are packed in gorgeous silver circular case with a transparent lid. It has a velvety smooth formula and is available in 24 metallic shades. They work amazingly well with a wet brush and last on and on. Colors like Girl Talk & Golden Peach are the bestsellers from this range. We can’t rave enough about them and hence, recommend you to try them! NYX makes some amazing eyeliners but their new Vivid Brights Liners are easily the best colored eyeliners in the market. Available in 9 popping colors ranging from a bright purple and pink to blues and greens, these eyeliners are perfect for the girl who loves experimenting with eye makeup. The liners are easy to apply, have an amazing pigmentation and stay put for a decent amount of time. 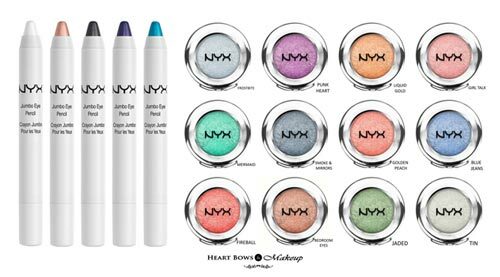 They are one of our favorite NYX products and absolute must have from the brand. After few hours of makeup, the face tends to become oily. To absorb the excess oil on the face without ruining your makeup, blotting sheets are a must have. NYX is one of the very few drugstore brands that has blotting sheets in their range. They come in different variants with with 50 sheets in it. The sheets absorb the excess facial oil reducing shininess and oiliness. This is surely one of the top NYX products and also made it to our Top 10 Blotting Sheets in India list. We hope our top 10 best NYX makeup products list with reviews & prices helped you in adding the right things to your shopping carts! Tell us in the comments below which NYX makeup product are you most excited to try. DIY: How to Make a Blingy Phone Cover! Best Bathing Soaps in India For Fairness, Oily & Dry Skin: Our Top 12!